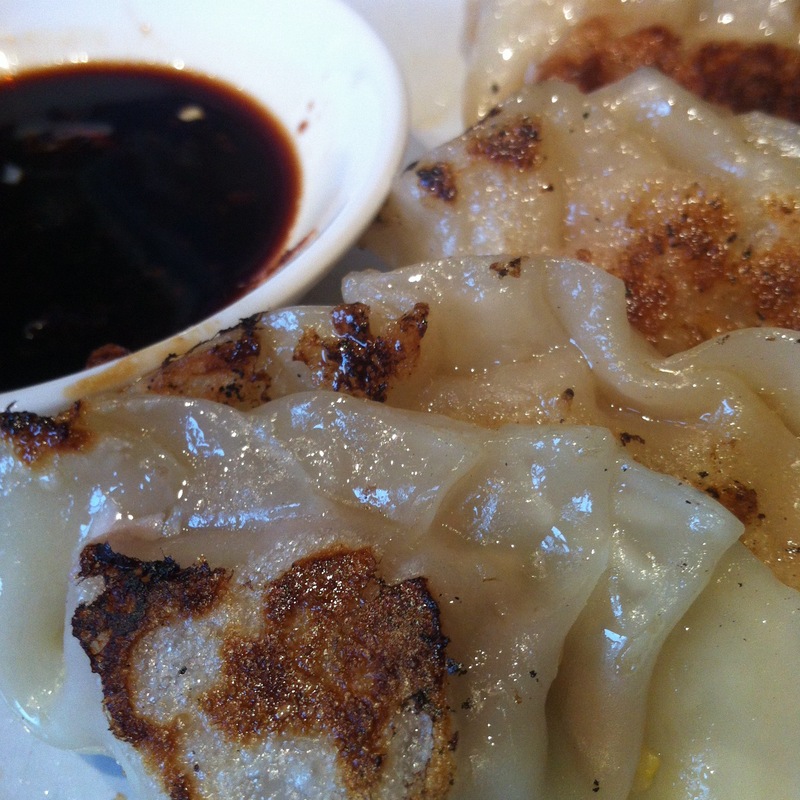 Dumplings make everything better. That’s it really. 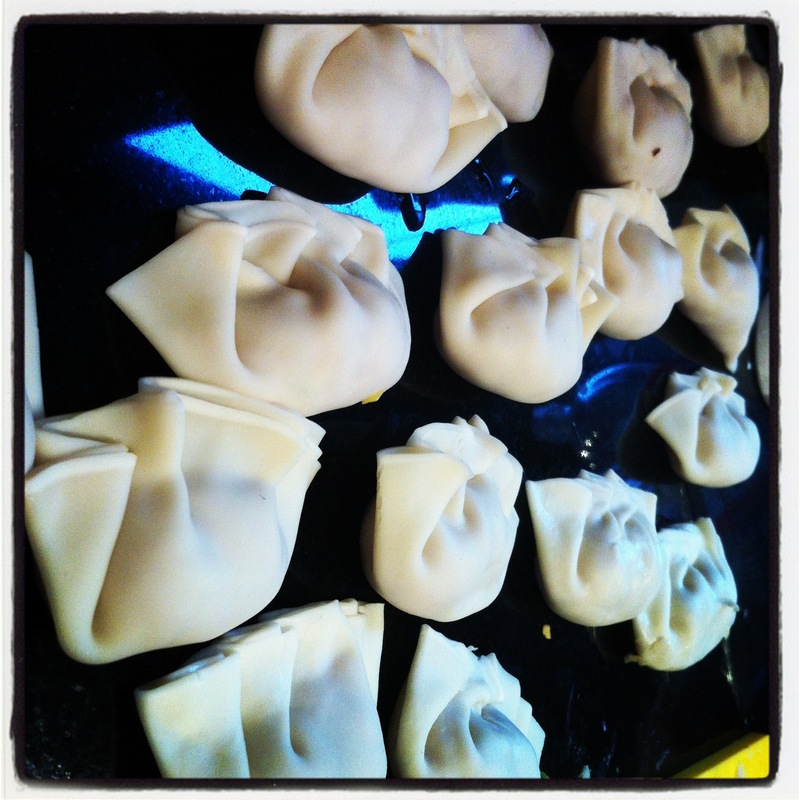 I had a complete brain fart the other week but a dumplings session with Woogs, Sarah and the world righted itself toot sweet. And don’t be nervous about working with the gow gee wrappers, they are remarkable robust and if sealing them with the little fancy folds is too intimidating then just moisten the edges fold the pastry over and voila, gorgeous half moons of goodness. Now, what follows is two recipes for you. The first is the one I have always used in the past, the other from Adam Liaw, winner of Season 2 of MasterChef Australia. I made this on the weekend and think it worth including here. The flavour is a lot more delicate and look, it’s just so easy. I tend to make a big batch of the filling and then freeze containers of what is left over so I can whip up another batch down the track. Sorted. Place a heaped teaspoon of mix in the centre of the wrapper, dab water around the edge and seal. Make sure there’s no air in the pocket with the meat. Either seal as a half moon shape or then bring the bottom of one side up, and again and again to make a little parcel. If using in a soup or to simply boil, drop into boiling water and once they rise to the surface cook for a further two minutes and then remove. 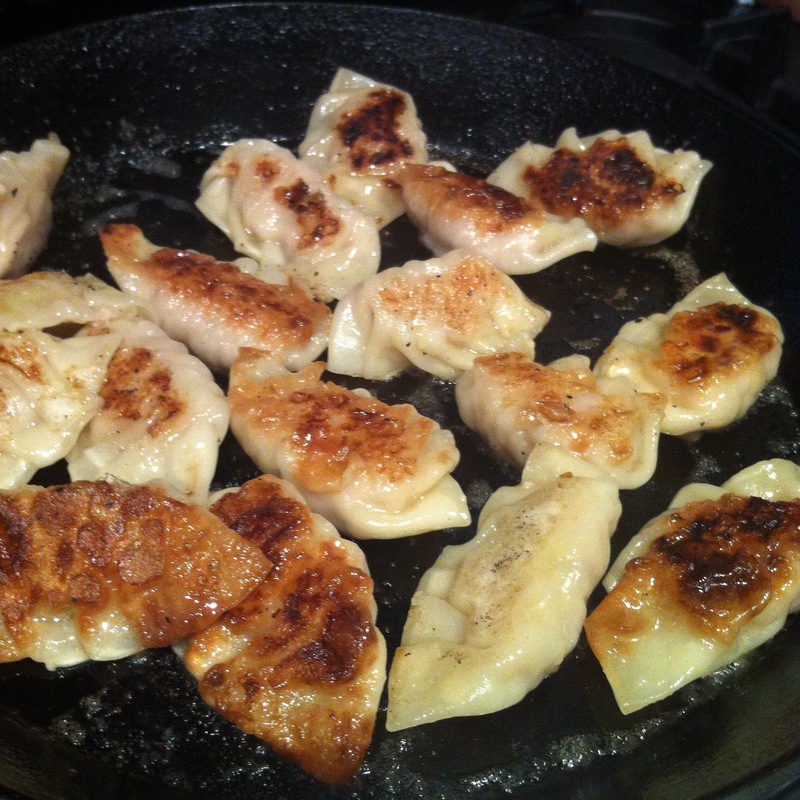 For pot stickers – heat a little oil in the frypan and add the dumplings. Brown a little and then add water half way up the sides of the dumplings. Keep cooking, shaking the pan a little every now and then until the water has evaporated and the dumplings are left to fry again. So Felix wanted to make dinner – how cool is that! 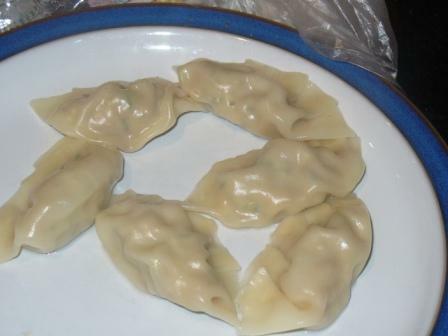 He looked through my recipe file and pulled out pork dumplings. This is great food for kids to cook. Easy to mix, easy to compile and DELICIOUS. The other week I dragged the boys to the Growers’ Markets. My main goal was to stock up on some pork products from these guys. By the time I got there – and it was only around 9am – they had no pork neck, no belly and no pieces to roast left. But she had pork cheeks and I thought, interesting. Cindy said to slowly braise them in some veggies but nothing too strong so as not to distract from the pork. So I did a shout out for ideas and between Joke, Badger and Blackbird I came up with something that at the end of the day was nothing like I’d planned or envisioned but lovely all the same. It was – as is the rule – even better the next day. There’s no real quantities here, just a journey. and struggle to decide what to do with it. Shred it? slice it? There was a LOT of fat. (Next time I’m following Joke’s suggestion and going to cure them.) While reducing the saucey veggies down on the stove top. 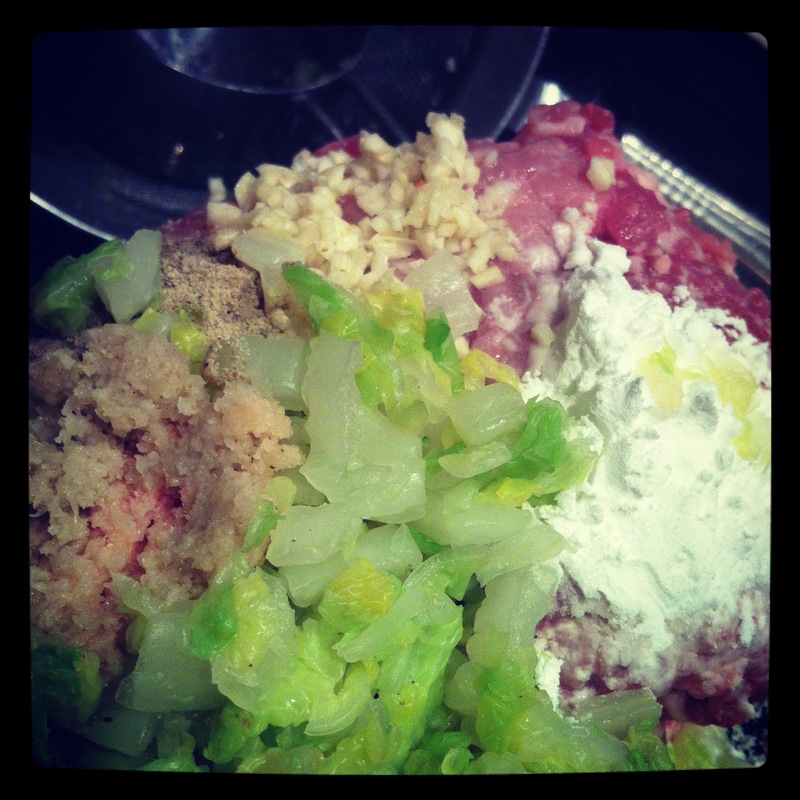 Return the meat to the sauce and add the finely grated rind of a lemon. I’ve conquered my pork cooking fears. Well, at least the roasting part. Next, chops. I grew up in a house where the only pork product ever consumed was bacon and even that was boiled before being fried to get rid of the salt. Dear GOD it’s a miracle I’m still alive. Anyway, because I didn’t grow up with pork, my cooking with it has always been hesitant. Combine that with appalling pork products available to us – pork that in a marketing executive fit of stupidity involved trying to pitch it as a healthy meat so breeders bred out the fat and therefore the flavour – and my experience has always left me wanting. But as artisan breeders start getting rare tasty breeds back into our butchers and onto our dining room tables, my willingness to try and incorporate this tasty meat into our diet is having pretty good success. Then, the other day, I roasted a piece of boned pork shoulder and Oh.My.GOD it was good. I served it with some roasted potatoes, pumpkin and sweet potato, peas, brussel sprouts and gravy. Cook over the flame until it thickens. Cooking the roast with the stock and wine in the bottom makes this gravy extra tasty. The boys had left over roast beef and gravy sandwiches the next day for school. So seven years ago I saw a recipe from Matt Moran, the executive chef at Aria, for a glaze for your Christmas ham and I decided that was it, I was going to do a warm glazed leg of ham for Christmas. It was a first. That is shocking I know, but I do not recall ever having warm ham EVER before that date. Sure, there was ham served at family Christmas gatherings, but it was always cold and I never recall seeing a whole leg in any form of presentation whatsoever. True story. I know. Sometimes even I am surprised I can boil water coming from that culinary wasteland. So I’ve now done a glazed ham every year. Normally our local butcher delivers the goods, but this year we went all out and got a kurobuta leg from the GOD OF BUTCHERY, Vic’s Meats. It was in a completely different league of SENSATIONAL.